November 23rd, 2008: Not a bad day; sunny, above zero for the most part, but a chilly wind later in the afternoon. Jenny stayed with us for a few days last week, then we stayed at her place in Kelvington on Monday and Tuesday. That gave us a chance to go to Greenwater for coffee Monday morning and Tuesday afternoon. That was a good time, both times! We saw a lot of the faithfuls including some of the Park staff. What a great bunch of people! The Marina has been frozen over for a long time, and there was a lot of ice on the south part of the lake, but the main body is wide open. I asked Millers to e-mail me when it froze over completely so I can keep my chart up to date. In 1999 it didn’t freeze until the 30th of November; in 2001 it was November 25th, but otherwise it was always frozen on or before November 16th. My dates go back to 1992. Gordon Davidson, of Bjorkdale, is one of those Ever-Ready bunnies that just won’t quit. When Evelyn and Don Naylor were married, on November 7th, 1958, Gordon and his band played at their dance. When they celebrated their 25th anniversary, again Gordon played for the dance. 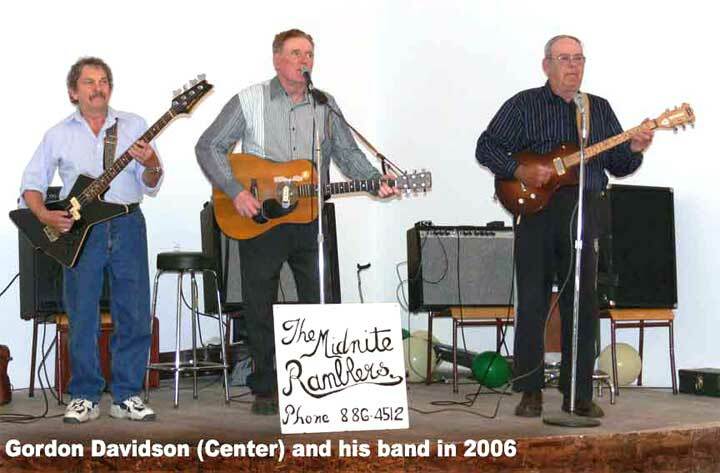 They celebrated their 50th anniversary on November 8th this year, and guess who played for the dance? Yep, it was Gordon again. I learned this at coffee on Tuesday from Don’s sister, Shirley Miller, but wish I had asked who the other members of the band were. There wasn’t much ice or snow in Saskatoon when we left here Sunday afternoon, but when we got to Grimson’s, the ground was covered with snow and the country roads were sheer ice, including Grimson’s driveway. When we got to Kelvington, it was the same, lots of snow and ice, and again at Greenwater. We gave our new winter tires a real test, and they came through just fine. When we got back to Saskatoon Tuesday evening, there wasn’t’ much snow, but it started early Wednesday and kept it up most of the day. Lots of ice, but the City was salting and sanding the important intersections and traffic moved pretty well. By Thursday afternoon much of it had melted away. Did you see that tribute to Wendel Clark at Toronto Friday evening? Pretty nice! They retired his jersey, Number 17, and hoisted a banner with his picture on it up to the rafters along with other super heroes of the game. Some clips from Wendel’s games were shown, including goals, fights, and heading for the dressing rooms. Wendel’s wife and three kids were there with him; we looked for Alma and Les, but didn’t see them. I’ll bet they were there somewhere. Altogether, a very nice tribute to a tremendously popular and successful hockey player. Our fourth great-grandchild was born at about two AM Thursday, November 20th. Atticus Ren Kopchuk-Swan, a beautiful, healthy and alert-looking little guy was born to Randonn Swan and Sean Kopchuk, our grandson (and first grandchild). They live in Moose Jaw. Sean’s mother, Sandy, was visiting at our place and got the word about three AM. We managed to restrain her until Friday morning, but she left before lunch. This morning, she e-mailed us some pictures. We picked up Lucille and dashed down to Moose Jaw to see him for ourselves. He looked even better than his pictures! 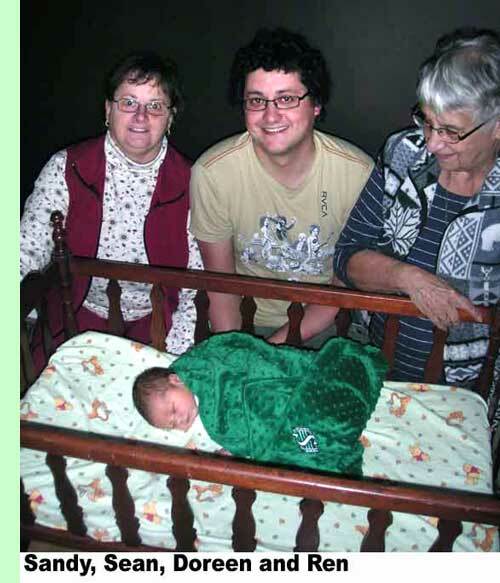 Of course, dozens of pictures were taken of the baby with his parents, grandmother, great-grand aunt, and great-grand parents. He slept peacefully through it all, so shouldn’t have been blinded by the flashes. 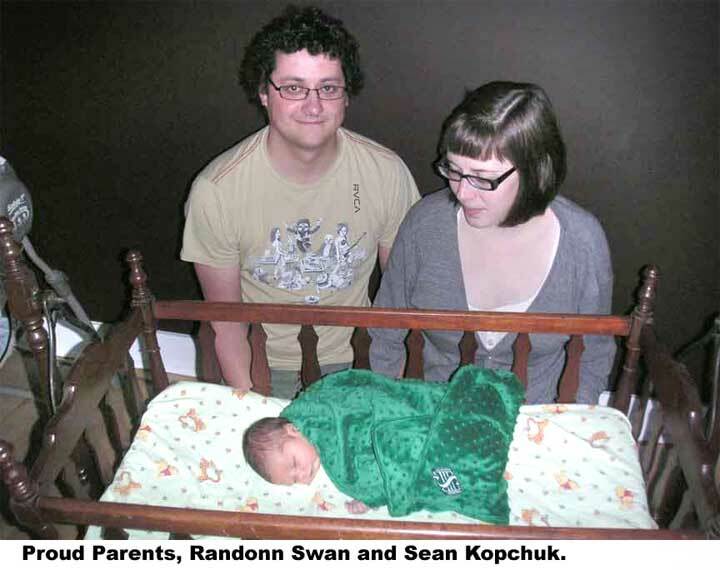 Since Aaron’s baby, Logan, had outgrown the family cradle, we had brought it to Saskatoon and Sandy took it to Moose Jaw. More pictures! Taryn Braxton, Logan and Ren (easier to say than Atticus) are the sixth generation to be rocked in that cradle.